Cleveland Browns quarterback Baker Mayfield (6) throws a pass during the second quarter against the Houston Texans at NRG Stadium in Houston. Rookie quarterback Baker Mayfield threw a 31-yard touchdown pass to Breshad Perriman on the opening possession to give the Cleveland Browns an early lead over the Denver Broncos. 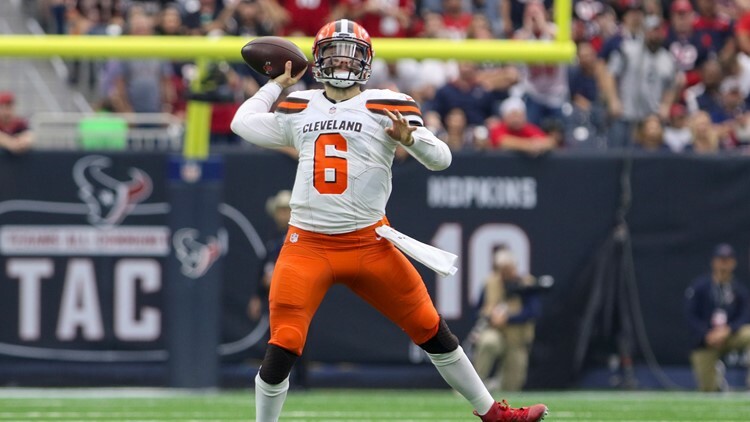 Cleveland Browns rookie quarterback Baker Mayfield posted on Instagram how he was “feeling dangerous” again this morning, and he certainly proved it on the first drive of the game against the Denver Broncos inside Broncos Stadium at Mile High Saturday night. Mayfield completed two of his three passes for 50 yards on the opening drive, and 31 of those yards came on a deep throw down the right side of the field to wide receiver Breshad Perriman. After securing the catch inside the Denver five-yard line, Perriman fought his way into the end zone for the touchdown.